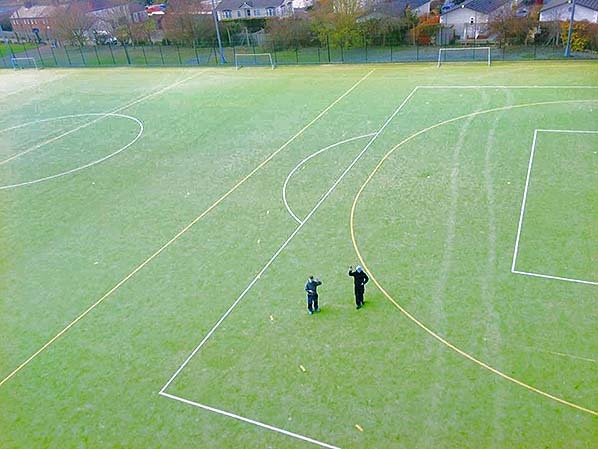 Present state: The site of the station is now occupied by Monmouth School playing field. 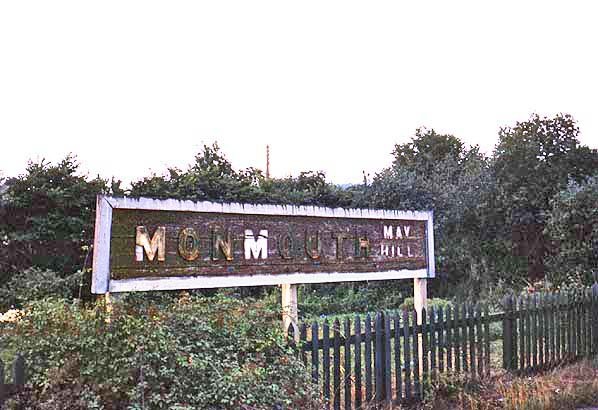 Notes: Monmouth Mayhill (later usually May Hill) was one of two stations that served the town of Monmouth, and was situated on the opposite bank of the river River Wye from the town. It was initially the terminus of the Ross and Monmouth Railway which was opened in 1873. The line was extended across the River Wye to the junction station of Monmouth Troy in 1874 with the construction of the Duke of Beaufort Bridge which was a three-span wrought iron structure almost 300 feet in length, with a bowstring central section. Mayhill was originally opened as a temporary station, but it soon became permanent. It was built on the site of May Hill Wharf, where goods were loaded onto barges on the River Wye. May Hill never had goods facilities with all goods traffic being handled at Monmouth Troy which was better sited for the town. There were however two private sidings, one serving Monmouth Gas Works and the other serving the Monmouth Steam Saw Mills, Coal and Lime Company. The Railway Clearing House Handbook of Stations for 1956 also shows a siding serving the Ministry of Agriculture Fisheries and Food, May Hill Depot. The station was provided with a single platform on the north side of the line with two single storey timber weatherboarded buildings. Initially there were two signal boxes one on the platform and the other at the north-east end of the platform. The northernmost box would have controlled the gasworks siding as access to this involved a reversal. In the early years of the 20th century these were replaced by a new timber signal box at the south-west end of the platform. The gasworks siding would then presumably have been controlled from a ground frame unlocked from the new box. 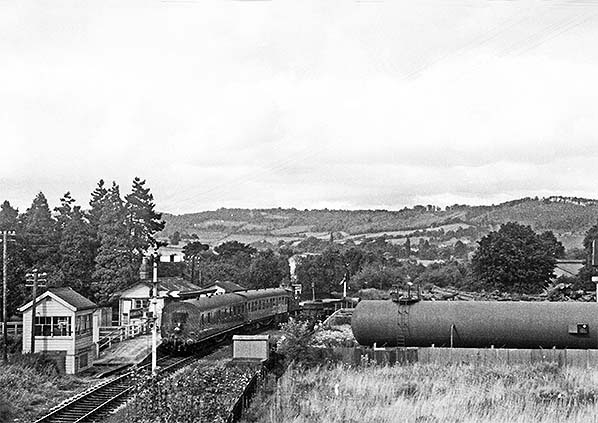 After closure of the station in 1959 a spur from Monmouth Troy over the Duke of Beaufort bridge allowed freight trains to reach the private sidings at May Hill until closure of the Chepstow line on 6 January 1964. 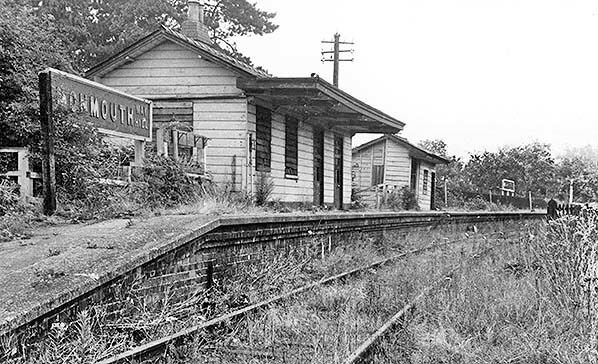 The station buildings and signal box were demolished c1968. The Ross and Monmouth Railway (sometimes referred to as the Wye Valley Line) was a standard gauge railway of 13 miles which ran between Ross-on-Wye and Monmouth. It was authorised in 1865 by an Act of Parliament and opened on 4 August 1873. Contractor was John Firbank who took eight years to construct the railway, which was opened on 4 August 1873, with its terminus initially at Monmouth Mayhill. The bridge over the River Wye was completed in 1874, a few months after the line's official opening ceremony. On the bridges completion the line was extended to Monmouth Troy, the extension was officially opened on 1 May 1874. There were five stations on the 12 1⁄2 miles long line, Ross-on-Wye (already constructed for the Hereford, Ross and Gloucester Railway), Kerne Bridge, Lydbrook Junction, Symonds Yat, Monmouth Mayhill and Monmouth Troy. Two halts were added later, one at Walford (opened in 1931) and the other at Hadnock (opened in 1951). 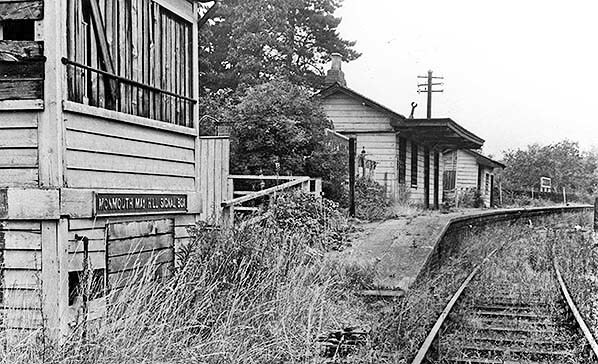 Hadnock Halt was only open for eight years, it was closed in 1959 when passenger services were withdrawn from the line. Starting at Ross-on-Wye the line skirted around the southern outskirts of the town before heading west down the Wye valley on the river's south bank. The line passed through Walford, and Kerne Bridge then to avoid a long detour along a bend in the river crossed onto the opposite bank, went through a tunnel before recrossing the river. Here the line met the Severn and Wye Railway just before Lydbrook Junction. The line continued on the south bank of the Wye going through a tunnel just before Symonds Yat to avoid a three-mile bend, past Hadnock to Monmouth Mayhill and then Monmouth Troy. From the start, the line was operated by the GWR under its company, the Monmouth and Hereford Railway. This allowed the GWR to run through trains from Monmouth via Ross on Wye, and onwards to Hereford via the Hereford, Ross and Gloucester Railway, without passengers having to change trains, or trains to change locomotives. The railway remained independent until 1921 when the 1921 Railways Act forced its amalgamation with the Great Western Railway. The line remained under the management of the GWR until the 'big four' railway companies were nationalised. In January 1959 the Wye Valley Railway and the passenger services were withdrawn. The last ever passenger train was a 'special' service, it ran from Chepstow to Ross-on-Wye along both the Wye Valley Railway and the Ross and Monmouth Railway. It was the only known train to make the trip in one single journey. The section between Lydbrook and Monmouth was closed completely but the section between the Lower Lydbrook Viaduct and Ross-on-Wye remained open until 1 November 1965. On 16 December 1910 South Wales experienced its strongest gales for many years eventually developing into a hurricane. Immense damage was done all over the district and railway traffic was seriously disrupted. Inevitably the hurricane was followed by what became known as the Great Flood of 1910. 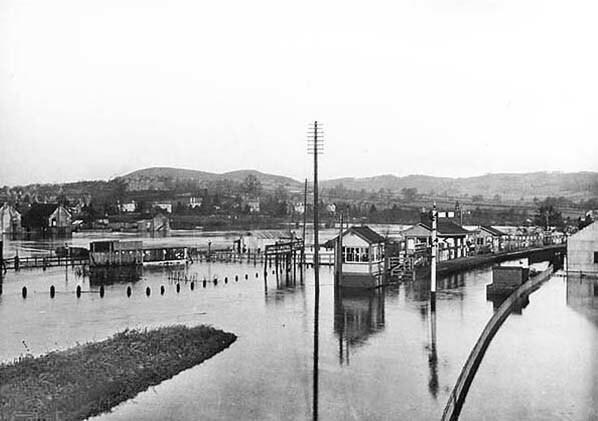 Monmouth May Hill Station is seen under flood water, probably in 1910. The River Wye runs across middle, quayside buildings are seen in the middle and to the left. Click here to see other pictures of the Great Flood in Monmouth. 1881 1:2,500 OS map shows Monmouth May Hill station as built. There are two signal boxes at the north end of the station, the northern of these controlled access to the private sidings as this required a reversal. There are two sidings, one serving the Monmouth Gas Works and the other the Monmouth Steam Saw Mills. 1953 1:10,560. The two signal boxes shown on the map above have been replaced by a single box at the south end of the platform. 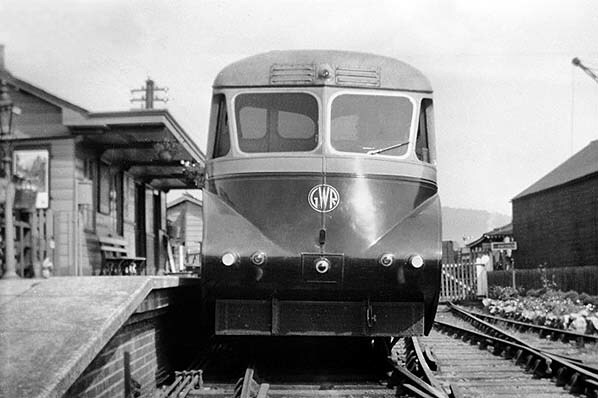 A GWR diesel railcar stands at Monmouth May Hill apparently when still fairly new, dating the picture to around 1936/7. The railcars came in two basic forms, at least externally; the streamlined types as seen here and the later more angular types. The streamlined examples, Nos. 1 - 18, although appearing superficially the same differed greatly in detail and when a number is unknown these differences help with identification. The railcar seen here, on the assumption it was still fairly new when photographed, is either No.10, No.11 or No.12. The telltales are the vents above the windscreens, the position of the marker lights and the oil cooler beneath the cab, although others were fitted retrospectively with the latter device. Powered by a pair of AEC A165 6-cylinder 8.85 litre 130bhp at 2,300rpm vertical diesel engines (No.1 had a single engine and proved to be underpowered) all the railcars gave good service unless, that is, they caught fire - something they had a habit of doing. The final examples continued in service until 1962 and three are preserved. Unfortunately the service being worked by the railcar at May Hill is not recorded but is probably to/from Ross-on-Wye and Monmouth Troy or Chepstow. If the latter, the railcar would call at Wyesham Halt which was arguably Monmouth's third 'station'. The harsh winter that arrived in January 1947 resulted in heavy snowfall across Britain. The snow melted in March, causing flooding along rivers, including those with catchments from central Wales. 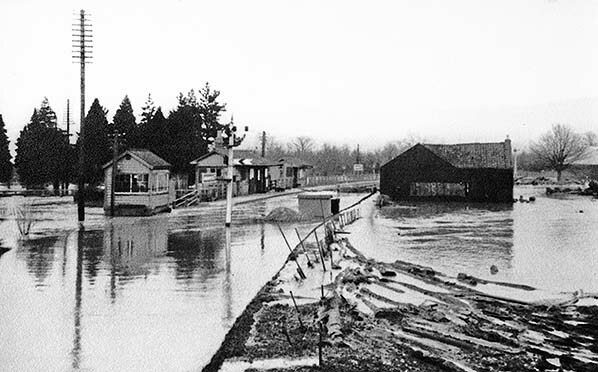 May Hill station was again flooded when the River Wye burst its banks. Monmouth has flooded several times since but a flood defence scheme was installed in the 1990s and the town is no longer affected. An auto-train waits at Monmouth May Hill as what appears to be the driver strolls along the platform towards the driving cab. The view is undated but, for reasons which will become clear, it is after 1956. The locomotive, or rather steam from it, can just be seen at the far end. It will likely be either a 0-4-2T or an 0-6-0PT but is otherwise unidentified. The auto-trailer (or autocoach) is No. W238W, from the final batch of Hawksworth-designed vehicles built in 1954. These were the final GWR-designed passenger vehicles to be built by British Railways. When new they wore the, then, standard BR passenger livery of crimson and cream but from 1956 unlined crimson was applied followed soon afterwards by unlined maroon. From 1959 lined maroon was applied. In this view W238W is wearing one or other of the plain unlined liveries, hence we know the photograph dates from 1956 to 1959 when, of course, the line closed. A number of auto-trailers have survived into preservation, including W238W, but this track-level view is convenient for describing a few features of the driving cab end. As was standard on the GWR and, for a time, on the Western Region, right hand drive was employed as indicated here by the windscreen wiper. On the auto-trailers these wipers were hand-operated and as comical as this may seem today, hand-operated wipers were once common on road vehicles. Auto-trailer drivers would not, however, drive with one hand permanently swinging the handle inside the cab but would just operate the wiper at intervals. Steam locomotive drivers were, after all, quite used to driving without wipers (a couple of steam locomotive classes were fitted with them). However, quite why BR saw fit to install hand operated wipers as late as 1954 is puzzling as vacuum operation would have been perfectly feasible as would electricity. The warning gong was operated by a foot pedal and the cable linkage between pedal and gong can just be seen to the immediate left of the centre windscreen. Behind the centre windscreen the parking brake handle can be seen. The regulator was also behind this windscreen and is just visible to left of the signal reflection. The regulator was mounted above the windscreen and on the triangular plate seen here. Beneath the bufferbeam and to the left of the coupling the screw, nut and linkage for the parking brake can be seen. Also beneath the bufferbeam but not immediately obvious is the linkage from the regulator. This passed via a bell crank arrangement to rodding beneath the body and at the non driving end operated a swinging arm to which was connected the linkage to the locomotive regulator. Communication between driver, when in the auto-trailer, and fireman was via an electric bell and system of codes. Over and above his normal duties the fireman was also required to operate certain of the locomotive controls when the driver was 'at the other end' and for this reason only senior firemen operated on auto-trains. On the station, the gas lamp nearest the camera has an inverted mantle while the delightful lantern beneath the canopy appears to retain the by-then-outdated upright type of mantle. Gas was supplied from the nearby Monmouth gasworks. Upon nationalisation in 1948, private owner goods wagons running on what had become British Railways were transferred to state ownership. Many were in poor condition and scrapped but others continued to run and with their original identities for many years. One such can be seen here on the right, although some repairs to the planking have obliterated part of the name. To the right two wagons can be seen in the Monmouth Saw Mills sidings, one appears to belong to a company called Shamston. Monmouth May Hill in 1958 with a train preparing to depart towards Ross-on-Wye. The locomotive is a 48xx/14xx 0-4-2T. The nearest carriage is of interest, being one of twelve Collett Diagram A44 'autocoaches' (the GWR/WR term for a push-and-pull driving trailer) converted in the mid-1950s from Diagram D117 57ft brake thirds. Numbered W245W - W256W, the conversion involved the fitting of a driving cab which was a horrible affair being just 3ft 3in deep and with no access into the brake compartment. In the cab, the driver was squashed between the driving controls and the rear bulkhead. Other work entailed altering the bogie centres and, of course, fitting the auto linkages. The installed windscreen can be seen in this view; a single-piece of glass located centrally and whilst this was practical it did nothing for aesthetics. The Southern converted some Maunsell stock in the same style and these also looked distinctly odd. Visible here is the large warning gong on the end of the driving trailer, the driver having control of both this and the locomotive whistle. One oddity concerning the operation of GW autotrains was the vacuum brakes; when in the driving trailer the driver could apply but not release them, this being the job of the fireman. This meant the fireman was, over and above his normal duties, also partly responsible for the driving controls and for this reason only senior fireman, in other words 'passed fireman', were permitted to work on autotrains. Driving trailers W245W - W256W were converted for intended use in South Wales but the advent of DMUs saw them dispersed elsewhere and they could ultimately be seen anywhere from Cornwall to the West Midlands. They arrived to coarsen drivers' language in the Wye Valley during 1958. The other vehicle in the train appears to be a Collett 60ft type but the photograph is too unclear for a positive identification. To the left of the driving trailer a running-in board can be seen; on these May Hill was presented one word above the other in small letters at the right hand end (see other views of the station). The River Wye runs to the immediate left of the station, ie to its west side, but is out of view here. There is still some evidence of goods activity with a couple of wagons just visible in the centre of the picture and to the left of the cylindrical tank, the purpose of which is unknown. As May Hill didn't handle goods traffic these would have been for the saw mill. Monmouth gasworks was opened in 1846 by the Monmouth Gas and Water Co. Ltd. It was located to the south-east of May Hill station and served by a spur which branched off north of May Hill and curved sharply south-eastwards. Almost impossible to see in the view, it runs just in front of the large tree in the right background. Said to have been frequented by Charles Rolls (Rolls Royce) to fill his balloon with gas, the gasworks closed during the 1960s with the coming of natural gas. With the closure to passengers in January 1959 all traffic ceased. This and the following two pictures are undated but probably date from the summer of 1959 or 1960 before the track was lifted. This view is looking north-east. Another view looking north-east, all the station buildings including the signal box remained intact at this time and would continue to do so until the end of the 1960s. Monmouth May Hill station looking south-west. The station didn't have any goods facilities with all the town's goods traffic being handled by Monmouth Troy which was better sited for the town. There were however private sidings one of which served the Monmouth Steam Saw Mills Coal & Lime Company. 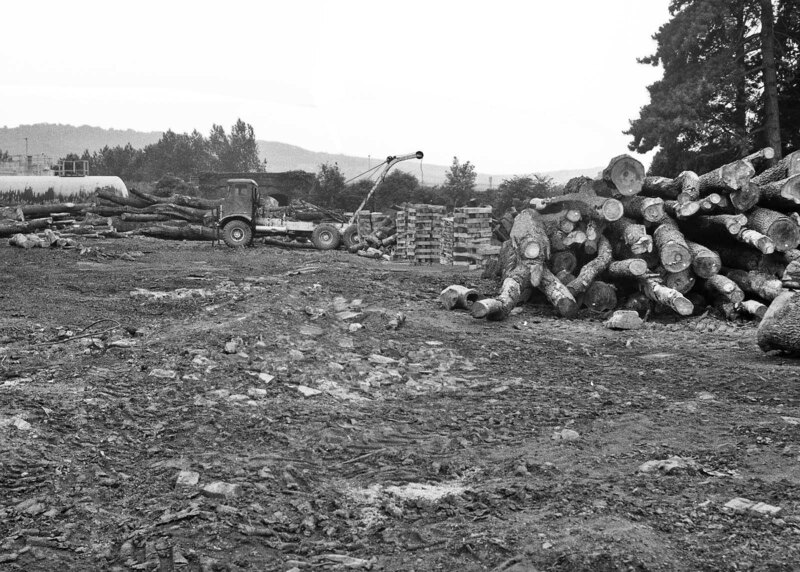 Piles of timber are already encroaching onto railway land. 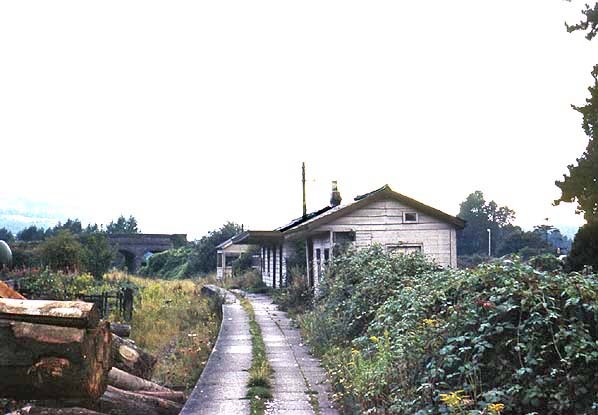 By September 1967 the track had been lifted for many years and although the trackbed and platform is now quite overgrown the station buildings don't appear to have deteriorated since the pictures above. 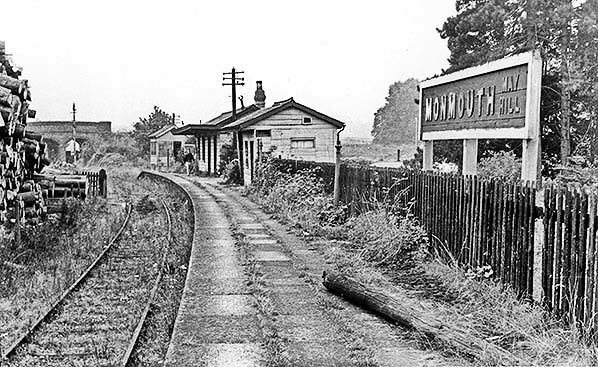 Looking south-west along the platform at Monmouth May Hill in September 1967. Timber from Monmouth Steam Saw Mills has encroached further onto railway land including onto the platform behind the photographer. All the buildings, including the signal box remain in reasonable condition. 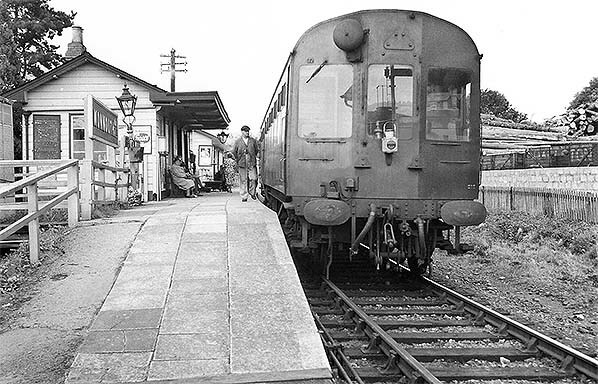 The two running-in boards were also still in place in September 1967, over 8 years after closure. Today they would have disappeared within a few days of closure, if not before! 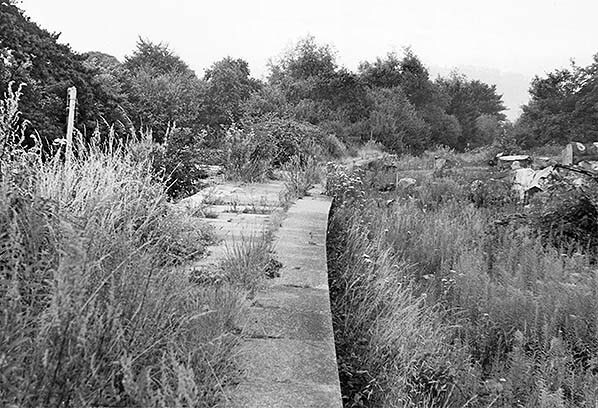 By July 1969 the station buildings have been demolished and the track bed is getting very overgrown. This view is looking north-east, the station building was to the left. 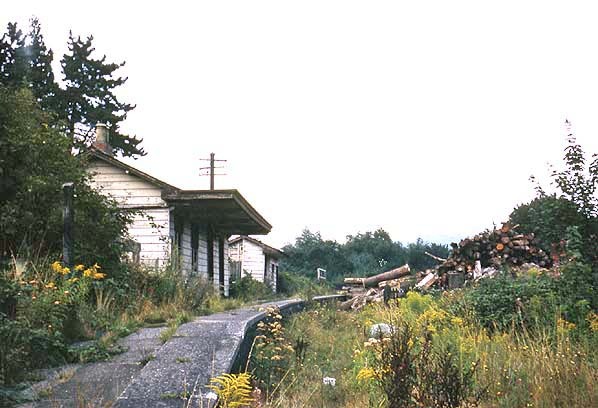 Once the platform was demolished the saw mills spread across the entire station site. This view shows the station site looking south-west circa early 1970s. The bridge taking the line under the A466 road is seen in the distance. Monmouth School playing field now occupies the site of May Hill station.